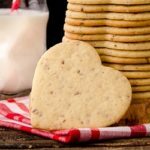 Sour Cream Pecan Sandies are thin, buttery, cutout cookies loaded with pecans. Forget store-bought, these homemade ones are divine. Grind pecans in a food processor. Whisk together ground pecans, flour, baking powder, and salt in a medium bowl. Cream butter and shortening in a large bowl. Add sugar and beat until fluffy. Add egg, sour cream, and vanilla. Beat until combined. Divide dough in half. Shape halves into disks and wrap with plastic wrap. Chill dough at least 3 hours or overnight. Preheat oven to 375°F. Line baking sheets with parchment or non-stick liners. Roll dough to 1/8-inch thickness on floured surface and with floured rolling pin. Continue to move dough around and sprinkle surface and rolling pin with more flour as needed. Dough will be soft and can stick easily. Cut dough with cookie cutters. Place cookies on baking sheets. Pull together scraps and re-roll dough for more cookies. You may have to re-chill dough if too soft. Bake for 7 to 9 minutes, or until the edges are golden brown. Cool cookies on baking sheet for 2 minutes. Yield can vary depending on size of cookie cutter(s) used.